Coe is the co-owner of At Home Animal Hospital as well as the hospital administrator. All of our clients should feel free to speak with him at any time. 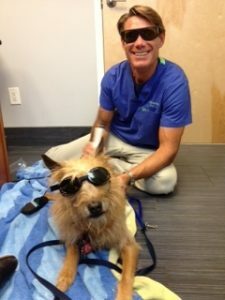 Besides managing the general operations of our veterinary hospital on Maui Coe also does most of the Laser Therapy treatments. He loves helping pets that need rehabilitation and enjoys sharing information and success stories about this very exciting and beneficial new pain management tool available in our Kahului’s animal hospital. When not at the clinic, Coe loves spending time with his little boy Max surfing and fishing while his two dogs Lily and Ele watch over them from the beach.